During its press conference on Wednesday at the IFA trade show in Berlin, Samsung (005930) announced its Windows RT-powered ATIV Tab. The 10.1-inch slate packs a 1.5Ghz dual-core processor with a 1.9-megapixel front-facing camera and 5-megapixel rear camera. The ATIV Tab also includes USB and uHDMI ports, and will come bundled with Office Home and Student 2013. As we’ve all come to expect, Samsung did not mention a specific release date or pricing for the ATIV Tab. Samsung’s press release follows below. BERLIN, Germany – August 29, 2012 – Samsung Electronics Co., Ltd, a global leader in digital media and digital convergence technologies, today announced its brand-new ATIV devices based on the Windows 8 for Smart PCs, tablets and Windows Phone 8 for smartphones. With the introduction of Microsoft’s Windows 8 and Windows Phone 8 operating systems, Samsung introduces “ATIV”, the new brand for its Windows-based devices. ATIV, the reverse order of the word VITA, meaning “Life” in Latin, is a pledge by Samsung to make everyone’s life extraordinary with excitement. The full range of Windows-powered devices will enable this goal. Today Samsung introduces ATIV SMART PC, ATIV Smart PC Pro, ATIV Tab, and ATIV S, a full range of ATIV devices. Samsung is one of very few companies that is capable of offering such a diverse product lineup and is committed to offering more choices based on the Windows 8 and Windows Phone 8 platforms for consumers. Samsung’s ATIV devices are simple, powerful, and beautiful. The Windows operating system is sleek, intuitive and compatible across devices. Together Samsung and Microsoft will provide users with an advanced, productive and creative experience with its ATIV devices. Its full lineup is designed for a simple user experience to share your work and ideas as well as enjoy consuming content. Furthermore, Samsung’s Windows devices are enhanced with Samsung’s own unique services and content. Samsung Family Story provides fun and intuitive content sharing. Samsung’s ChatON service complements Microsoft’s popular People Hub to provide a wide range of social communication options across these versatile devices. Combing revolutionary design, the power of a notebook PC and the convenience of a tablet PC, the 11.6-inch Samsung ATIV Smart PC and ATIV Smart PC Pro are Samsung’s next set of smart devices. These provide computing power with Windows 8 functionality as well as full Windows 7 compatibility. Each device features a detachable keyboard-docking system that allows users to easily switch between a clamshell notebook PC and a tablet PC form factor. These devices allow for great mobility with maximum productivity. An advanced 10-finger multi-touch screen provides a technological leap in interactivity, surpassing the traditional two-finger touch features. Its enhanced sensitivity allows users to pinch-to-zoom, rotate images and scroll through pages with ease to enjoy the full capabilities of the latest entertainment applications. In addition to commonly-provided input methods, the ATIV Smart PC and ATIV Smart PC Pro are equipped with the renowned S Pen, delivering real writing and drawing experiences for maximum productivity, both on the desk and on-the-go. Just like using a pen or pencil, the Wacom digitizer pen is capable of meeting the demands of professional designers with its 1024-level pressure sensitivity. The pre-loaded S Note application accompanies the S Pen to make writing and drawing as simple and intuitive as possible. While the S Camera fully exploits the performance of the integrated front and rear cameras, the S Player ensures seamless playback of images and videos in any format. This content is presented with Samsung’s SuperBright 11.6-inch Full HD LCD display, producing the most vivid colors and sharpness with 400nit brightness. Beautifully stylish and ultra-portable, the ATIV Smart PC and ATIV Smart PC Pro are only 9.9mm and 11.9mm thick, respectively; and there are no compromises on performance. The ATIV Smart PC Pro’s powerful Intel® Core™ i5 processor can handle particularly demanding professional use and multimedia consumption; while the ATIV Smart PC’s next generation Intel® Atom™ processor is a solid match for everyday productivity tasks. Despite their compact and portable form factor, the two devices feature USB 2.0(Smart PC), USB 3.0(Smart PC Pro), mHDMI, miniSD and two extra USB 2.0 ports on the keyboard. To get the experience going, the ATIV Smart PC has a battery life of up to 13.5 hours, whereas its stronger sister device, the ATIV Smart PC Pro, runs up to eight hours. 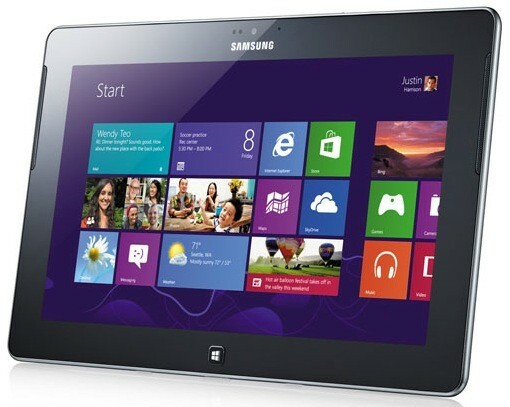 The new Samsung ATIV Tab is designed with a classy hairline finish, and delivers a full Windows 8-based PC experience with superior tablet mobility. Weighing 570g, featuring a 10.1” display, and measuring 8.9mm thick, the ATIV Tab is always ready to go. It instantly boots up without lagging and comes with Office Home and Student 2013 RT, offering the new versions of Word, Excel, PowerPoint and OneNote to help transform the way people get things done at home, school or work. These applications are fully featured with complete document compatibility, meaning people can open and create any document, make edits on it and share it with others just like we do with PCs. An 8,200 mAh battery provides enough power to allow you to work on your projects and review or share them virtually anytime and anywhere. Moreover, the ATIV Tab is compatible with a range of Windows-based PC devices and accessories, including printers, keyboards, projectors, external monitors, and other peripherals, through its USB port and uHDMI, with no need to install extra software. Samsung ATIV S is a new smartphone for both work and entertainment featuring Windows Phone 8.. ATIV S brings a stunning hairline design and high performance with a range of content-sharing and productivity options. Its impressive 1.5GHz dual-core processor and HSPA＋42 connectivity enable great browsing performance and high responsiveness even for the most demanding gaming or work applications. Users can enjoy the brand new Windows Phone 8 experience on the ATIV S’s stunning 4.8” HD Super AMOLED display. Samsung ATIV devices will be on display at the Samsung booth #20 at IFA 2012 from Aug 31 through Sep 5.